In this video, I'll show you how to build a DIY light box using inexpensive LED lights. I made my light box into a sign, but there are tons of options! You could turn it into wall art for your kid's room or game room, or even make a similar sign for your business' lobby. Enjoy! 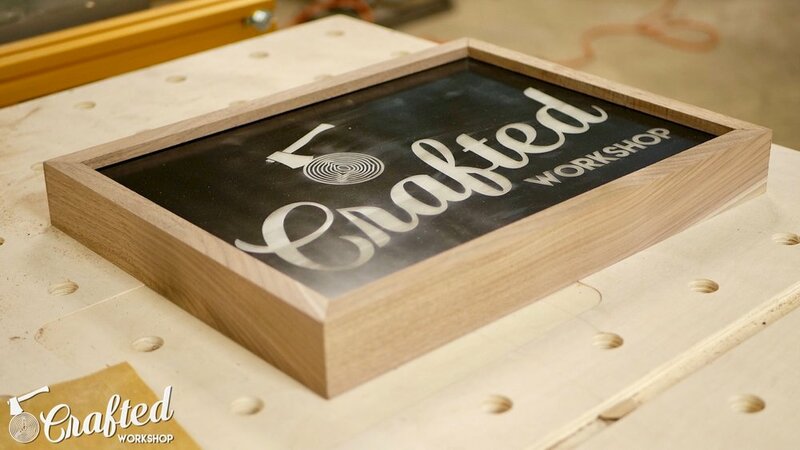 For this DIY Light Box Sign project, I used some rough Walnut I already had on hand, which meant I needed to dimension it first on the jointer, planer, and table saw. You could just as easily use a readily available hardwood 1x2 from the home center. The length of material you’ll need will depend on the size of your frame. A 6 foot long 1x2 should easily cover this type of build, unless the sign you’re making is huge. You’ve got lots of options for what you want the inside of the light box to show, but I wanted mine to be a sign with my logo. My buddy Brad over at Fix This Build That inspired this build, and he was nice enough to laser etch another piece of glass with my logo. Check out his version of this build here. With the wood milled to size and the inside of my light box decided on, it was time to start cutting the frame. I cut the four sides of my frame to rough length at the miter saw, making sure to cut away any of the sapwood or other imperfections. With the DIY light box pieces to their rough size, I then started cutting the 45 degree bevels. When deciding on the final size of my frame, I made sure to account for the material that will end up resting inside the grooves I cut in the next step. More on that a little later. Also, having some kind of stop block system will be extremely helpful here, since you can get each of the two lengths, one for the top and bottom and one for the sides, exactly the same. As long as those lengths are the same and your bevels are accurate, you’ll end up with a gap-free frame. It’s also a good idea to double check that your miter saw is dialed in to 45 degrees with a digital T-Bevel gauge. Any amount of inaccuracy will lead to gaps in your finished frame. Once I had all four sides cut to length with bevels on each end, I did a quick test fit. They were looking really good! Next, I needed to cut grooves into the inside of the frame to hold the piece of glass as well as the piece of ¼” Lauan plywood, which will make up the back of the frame. Remember how I said I accounted for the amount of material that will rest in these grooves when deciding on the dimensions of my frame? This is where that matters. 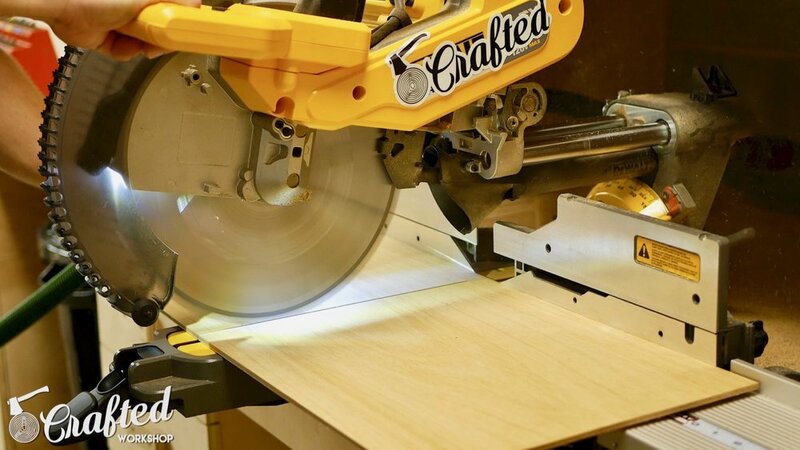 When deciding on my frame dimensions, I chose a depth of ¼” on all sides of the frame, so I set my table saw blade height to ¼”. I also wanted the two pieces in the frame to be roughly evenly spaced in the frame, with a little extra room in between the glass and the plywood back, so I set the fence to ⅜”, and made my first set of passes on each piece of the frame. 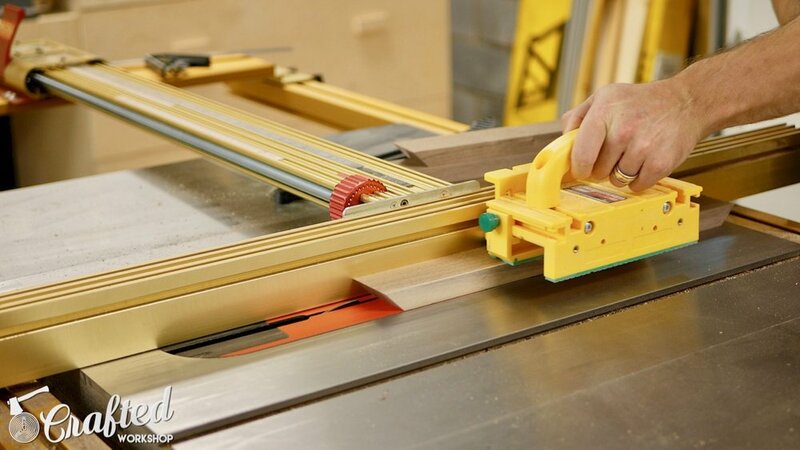 Since my table saw blade’s kerf, or thickness, is ⅛”, only one pass was needed for the piece of glass to slide into the groove. Next, I cut the groove for the plywood, which required two passes to get the ¼” thickness of the plywood. I cut one pass, moved the fence over ⅛”, then made another pass. With the grooves cut, I cut the plywood back to its final size on the table saw and miter saw. With all of the pieces cut to their final size, I did a quick test assembly of the DIY light box to make sure everything lined up, and everything came together really nicely. Next, it was time for paint. I painted the back of the glass white, just like Brad did in his video, to help diffuse the light. I think I might have done a few too many coats, because it ended up blocking too much light, making the lights hard to see in daylight. I also painted the plywood black, just to give it a nicer look. While the paint dried, I sanded all of the pieces of the frame with 80, 120, and 180 grit sandpaper. I just love the way this air dried Walnut looks, it’s absolutely gorgeous. To assemble the frame, I used screws rather than glue, since I wanted to be able to disassemble this if the light strip ever stops working, the glass breaks, or any other changes needed to be made. I could have plugged the screw holes with dowels, but that would have made disassembling the frame in case of any changes difficult as well. I actually kind of like the way the screws look here. With the frame assembled, I sanded all of the corners flush, and then it was time for finishing. For the finish, I used Waterlox, who is also the sponsor of this video. Waterlox is my new favorite finish on Walnut, it just looks outstanding. Waterlox is a mix of tung oil and resins, so it gives you the grain pop of an oil based finish but more protection than a straight oil finish. If you want to learn more about Waterlox, click here. I wiped on two coats, sanded with 320 grit paper, then wiped on one final coat. Next, it was time for the electronics. Here's the exact light kit I used, it couldn’t have been more simple. I went with a battery-powered strip, since my plan was to use this DIY light box sign at events I have a booth at, such as craft fairs and Maker Faire. Basically, I drilled a hole in the plywood back, ran the lights through that hole, and used CA glue to attach the lights to the inside of the back. In retrospect, I wish I would have used two of these light strips, since this really needs more light. On the back, I used CA glue to attach the little in-line remote, and then just used good old duct tape to attach the battery pack, since it will need to be removed when the batteries need to be replaced. Step 11 : Assemble the DIY Light Box Sign! And here’s the finished sign. As you can see, with the lights on, it’s pretty tough to see, but the real cool factor comes out when you turn off the lights. This particular light strip has all kinds of crazy color modes, and you can also just have one solid color if that’s more your style. Hopefully you guys enjoyed this project, I’m really happy with the way it turned out, and it was a great addition to my booth at the Atlanta Maker Faire. 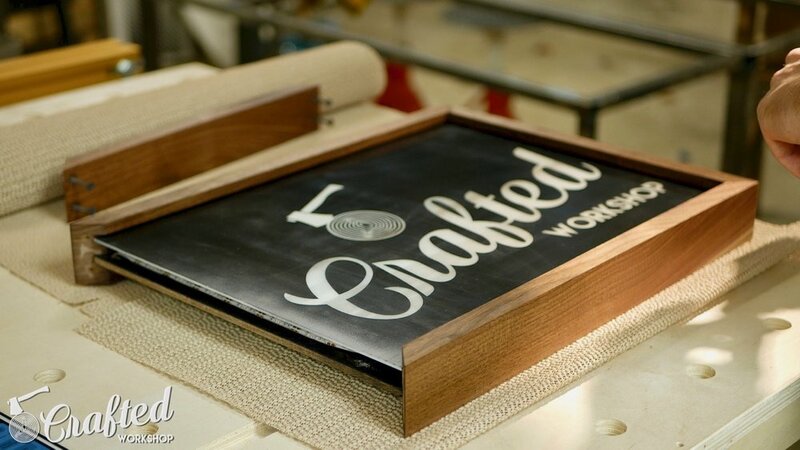 Again, you don’t need to have a laser etched glass insert here, there are tons of ways to get creative on a budget. This would also be great for a kid’s room, game room, and more. If you liked this build, maybe think about subscribing. I put out new project videos like this one every Tuesday. If you want to see another cool LED light project, check out my "How To Build A Coffin" project. Thanks, and until next time, happy building!